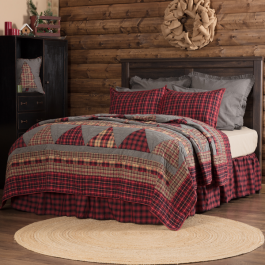 The Cabin Shop offers a wide range of quilts in a neutral color pallet. Designs range from traditional motifs to those inspired by nature and wildlife. 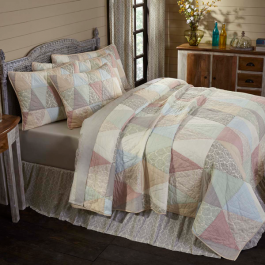 Coordinating accessories for these beautiful rustic quilts include pillows, shams ,bed skirts, throws and drapes. 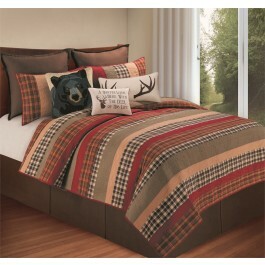 Please contact us if you need this bedding to be expedited. 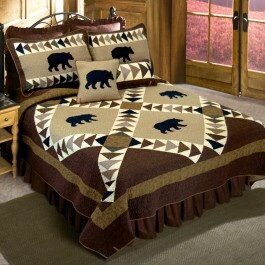 The Camo Bear Quilts feature an extra large block patchwork design in neutral shades of brown, caramel and green accented with a black bear silhouette. Quilt Set includes: Queen Quilt, (2) Standard shams and (1) dec. rectangular pillow. A series of rich woven plaids in brick red, autumn gold, navy and forest green help to make this an instant classic. The fabrics are arranged in large hopscotch blocks with cross-hatch quilting for a contemporary touch. 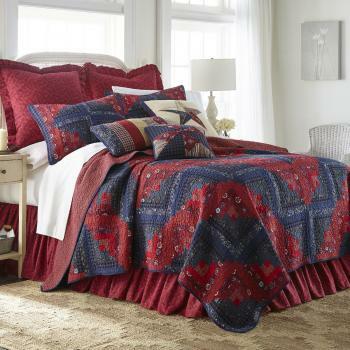 The coordinating quilted shams, pillows and valance carry this theme throughout your room. 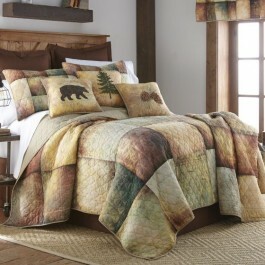 This fetching quilted bedding collection cleverly displays a watercolor forest scene inside a bear silhouette. 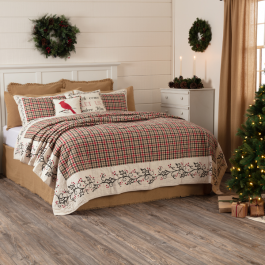 Weathered woodgrain and rustic plaid accents finish the design. Warm grey is the dominant color, with touches of slate, weathered gold, wine and chestnut brown. Our coordinating shams and accent pillows help to carry this theme throughout your room. 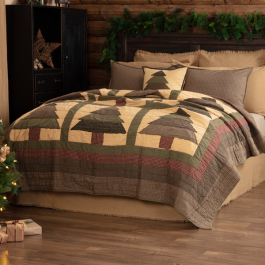 This beautiful Hillside Haven Quilt features a soft tan, red, orange and black colors and is made of cotton. 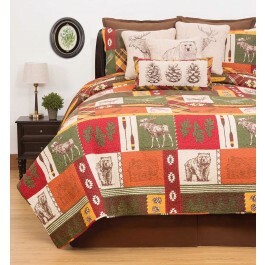 Keaton Forest Quilt Set features moose, bear, deer, fish, pine cones, canoe, oak leaves, log home. The quilt has bright orange, red, green and brown colors. Matching Decor Pillows are sold separately.